In the morning, you wake up early. You hear the silence that is no longer fully silent: somewhere far away, people are chanting. Someone outside the door is wiping the floor; the strokes against the ground remind of others, on other early mornings in other places. When you’ve stepped into your sandals, you open the door carefully. Yes, the sky outside has started to change colour. If you remain looking at it, each few minutes you can watch the transformation. You take the bike – it’s a heavy bike, one that takes an extra split second to turn in either direction, but also one that tells you “rely on me, I am here”. You pedal, your scarf falls off your one shoulder and get caught in the wind. It doesn’t matter actually if there is no wind – on a bike, you always move with the air moving around you. The streets are softer versions of themselves: there is no traffic yet, no heat and no sounds that speak louder than that the turning wheels, the flipping pedals. Sometimes they do, flip; yes, the bike is taking time with most of what it does. The temple is not far away. 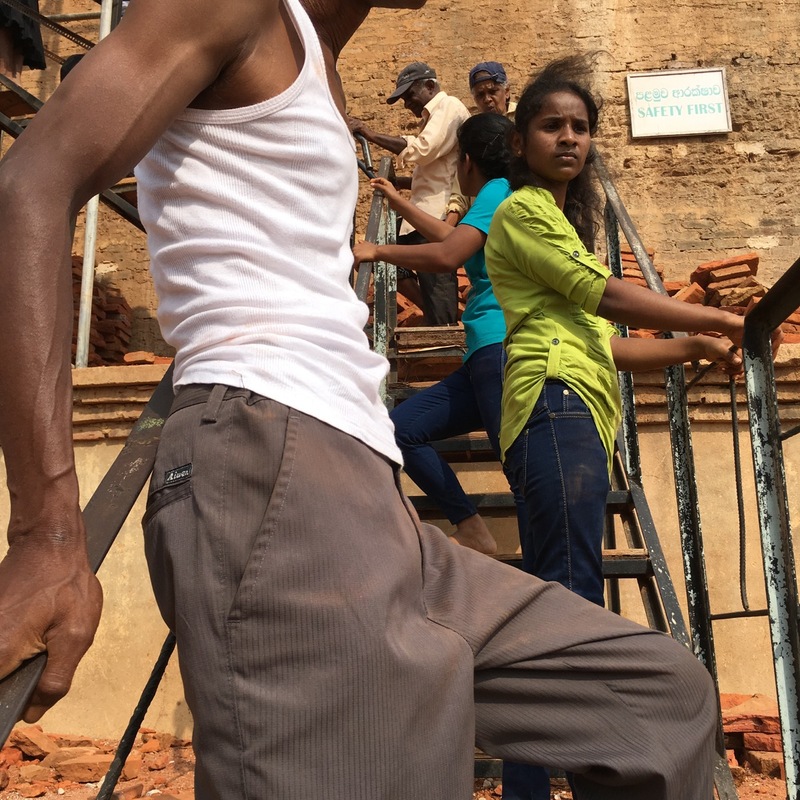 The old city of Anuradhapura, built brick by brick but with that amazing sense for detail, for essence, is just outside the new city; the network of busy roads, lined with buildings and shops selling white clothes for visiting Buddhist devotees and imported apples from China and local mangoes in all shades of yellow and green and all kinds of accessories you need for your mobile phone, is laid out as an appendix to the ancient, mysterious city once constructed several centuries BC. 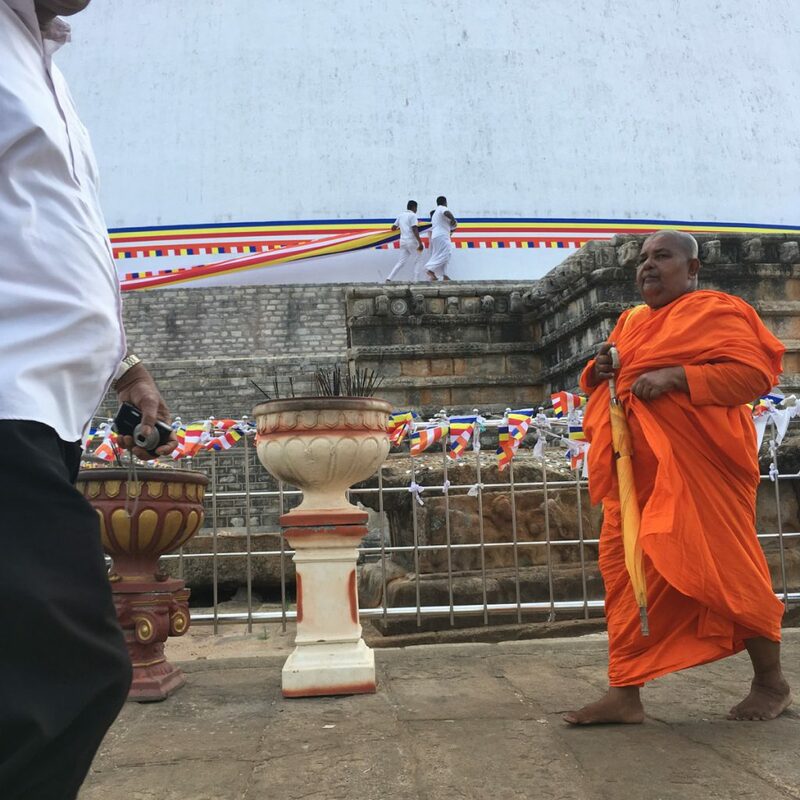 The UN is protecting it as a World Heritage site now (and the Sri Lankan government, in its craze to speed up the soon full-blown morph into an International Tourist Destination, has started to ask $25 for visitors to enter even somewhere near the scattered old ruins and many sacred temples). 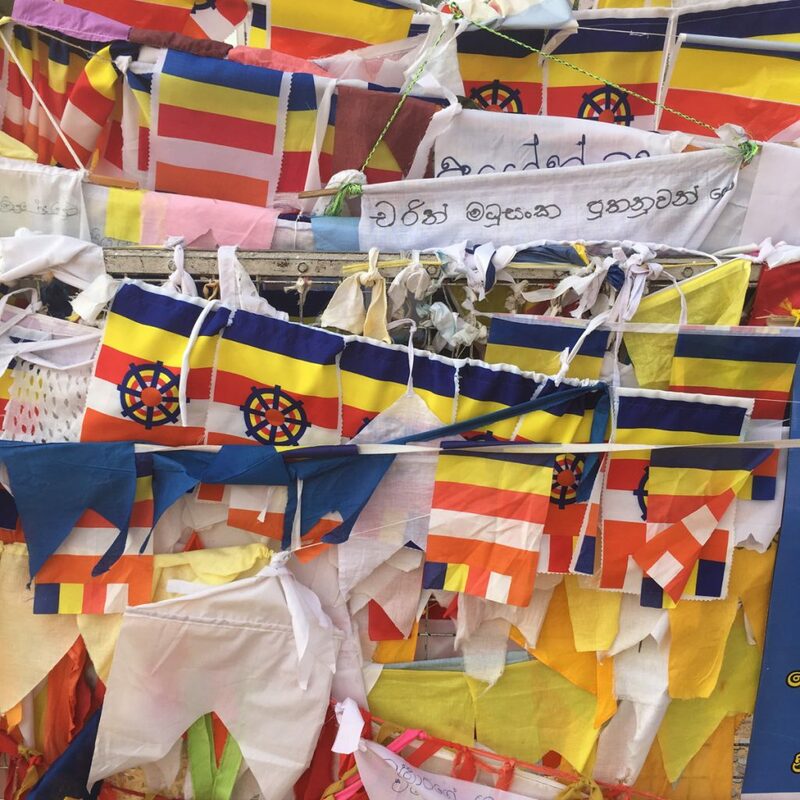 Tourists coming for a tour of beaches-mountains-temples, for which Sri Lanka is the perhaps most uncontested candidate, visit Anuradhapura en route to or from nearby places like hidden Buddhas in caves or hills and rocks with spectacular views. 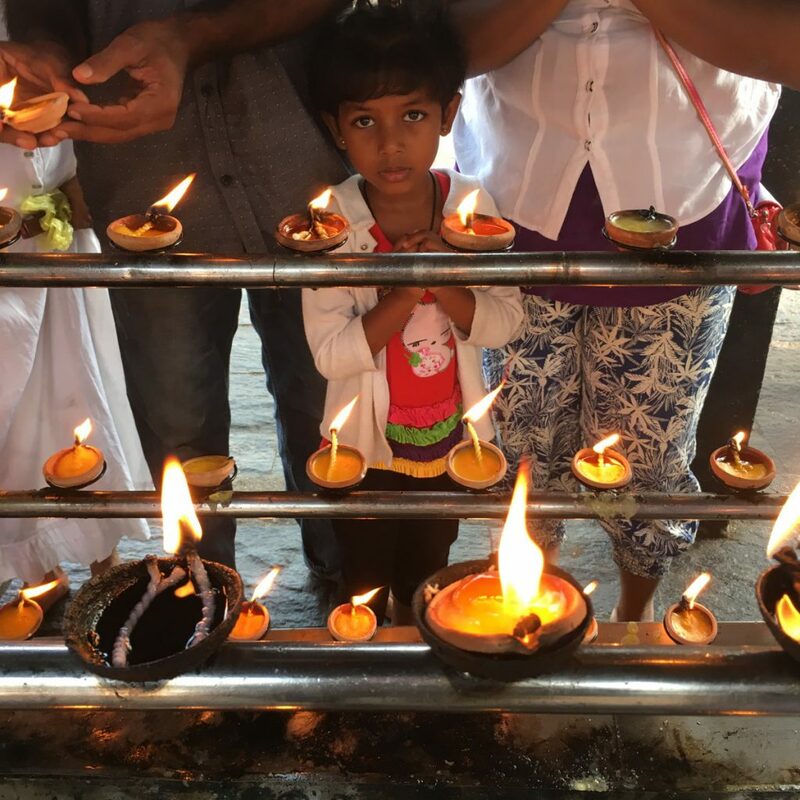 Sri Lankans, particularly Buddhists from the southern and central regions, come to pray and meditate in the city’s many open-air temples; they often hire buses, share the cost among the extended family and bring lunch packets from home, then drive – either for the day or with one or two night’s stay. 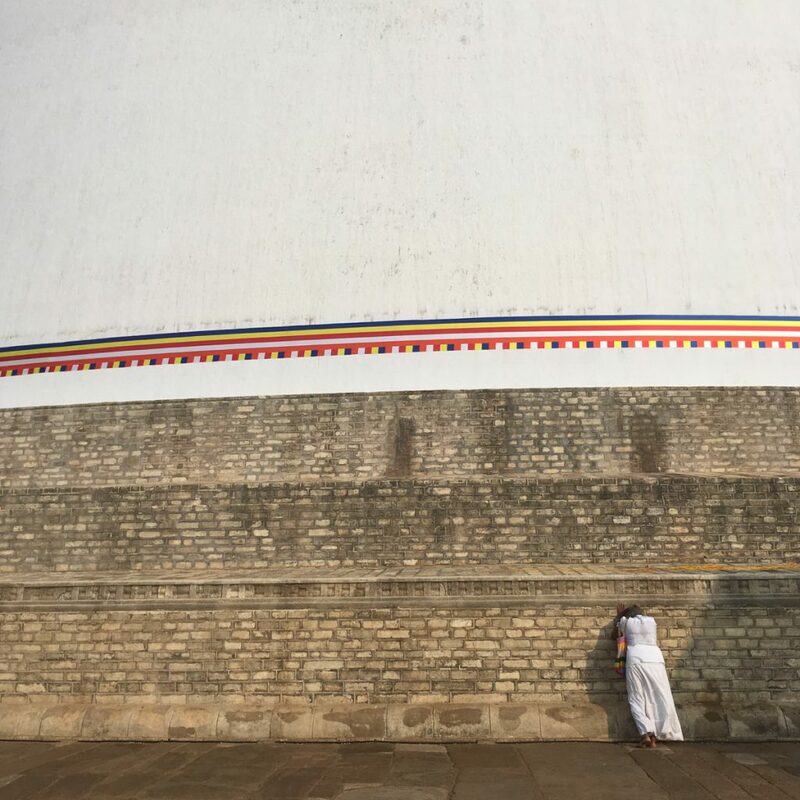 So the temples – the enormous and perfectly rounded, brilliant white and serenely quiet – are often busy places, with small or large groups of visitors with bare feet and sophisticated cameras zigzaging around each other. But not in the morning. Early morning, those who are in the temples have come for something else. 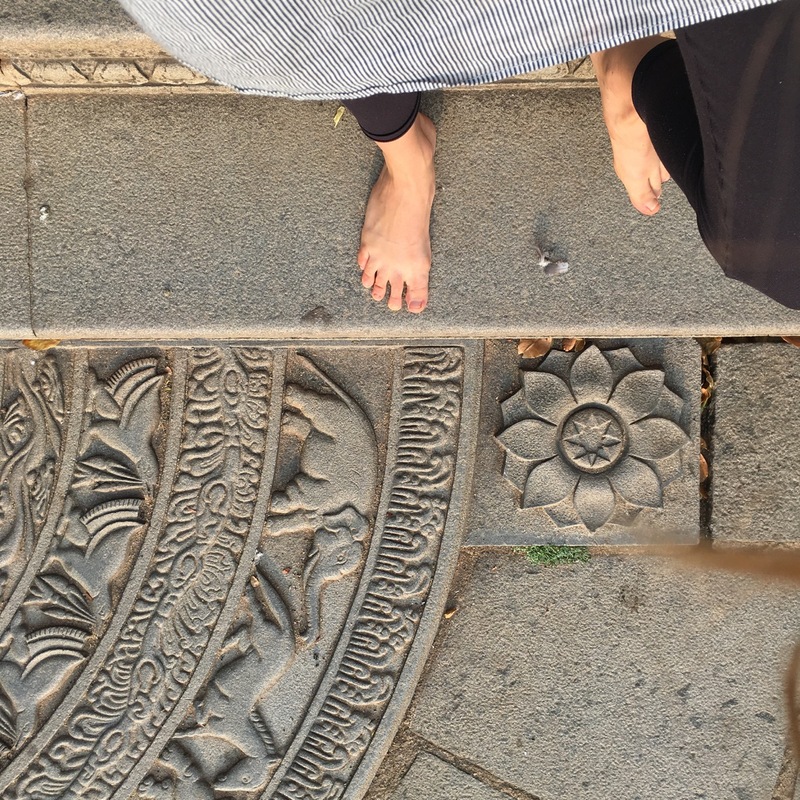 They have come for that moment – not for capturing it and preserving it as a holiday memory, but for staying with it for a short little while right when it happens. 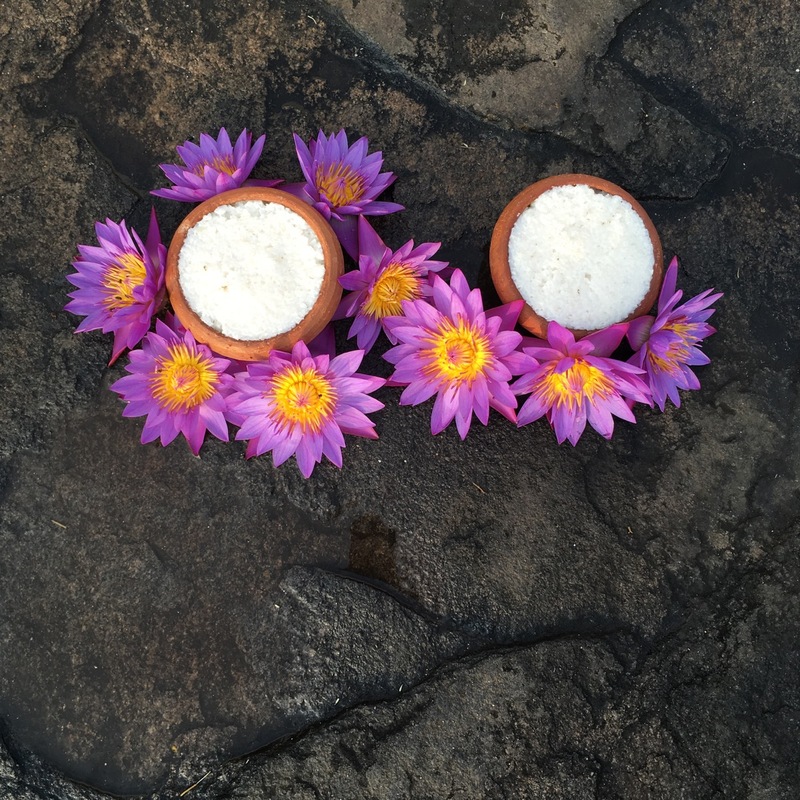 So when you enter the temple (whose stone floor, or bed of soft sand, at this time of the day is not yet warm but feels nice to walk on), there are people with lotus flowers, champa flowers, tiny candles and books with Sinhalese chants. They watch you, you watch them. You watch them in fascination; they watch you to see if you have something bananamangoguavapapaya in your hands. In your purse, your bag. They know: if it’s a plastic bag, it probably contains fruit. 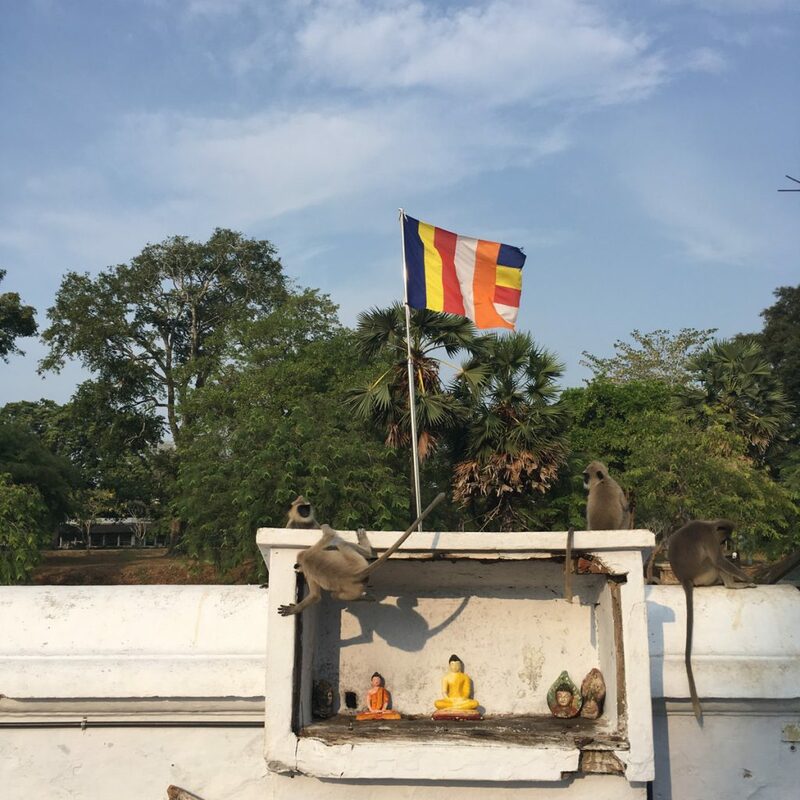 One morning, at the Ruwanwelisaya stupa, there were so many monkeys that morning, and maybe 25 of them had gathered in front of a monk and his devotees, chanting silently; they braved each other and jumped down, snatched the flowers and pieces of coconut the humans had brought as offerings. A small fight broke out – the biggest and loudest stole the booty from the others, tried the best they could to eat it all at the same time. 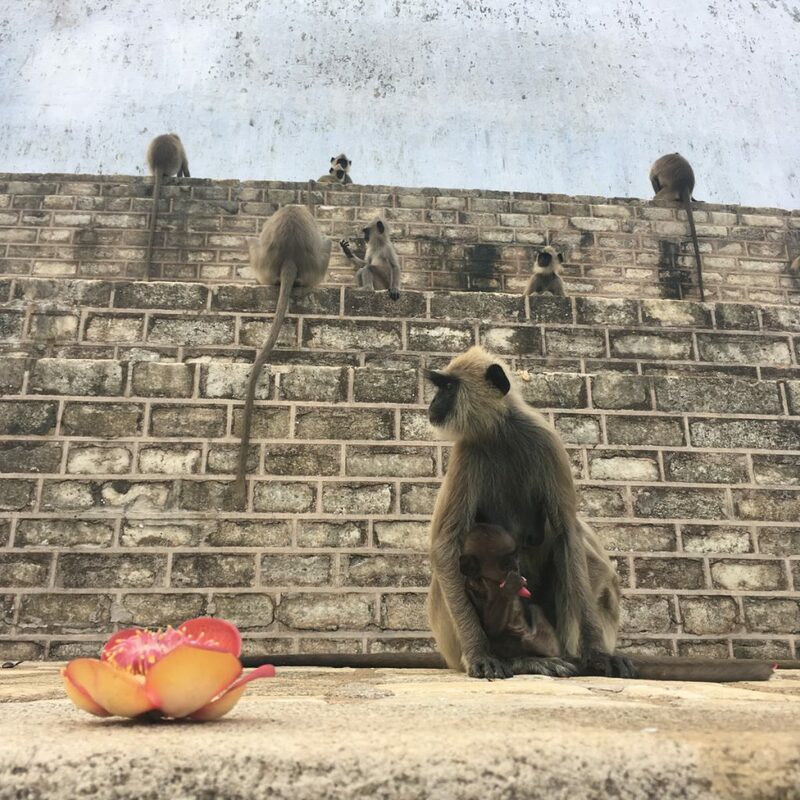 You can disregard the monkeys and they will disregard you – they are spoiled after all, these monkeys: they see many visitors each day, who bring many fruits and place before Lord Buddha. 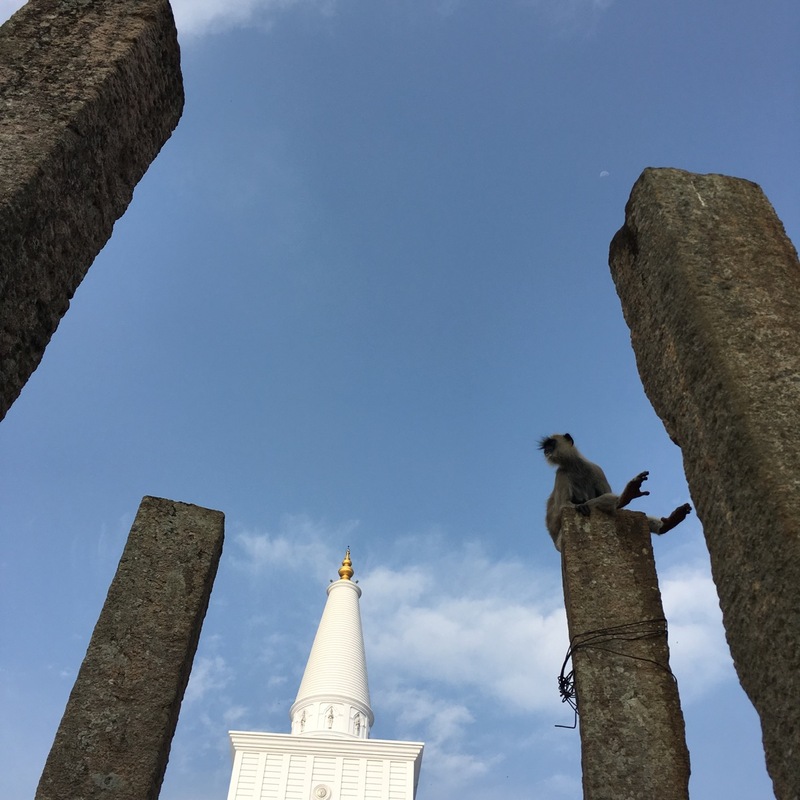 It’s a good place to be a monkey. As for you, you stay for a bit. Time is not so present here. Not for a few hours at least, until the ground underneath your feet has become so hot by the midday sun that you get reminded to leave. 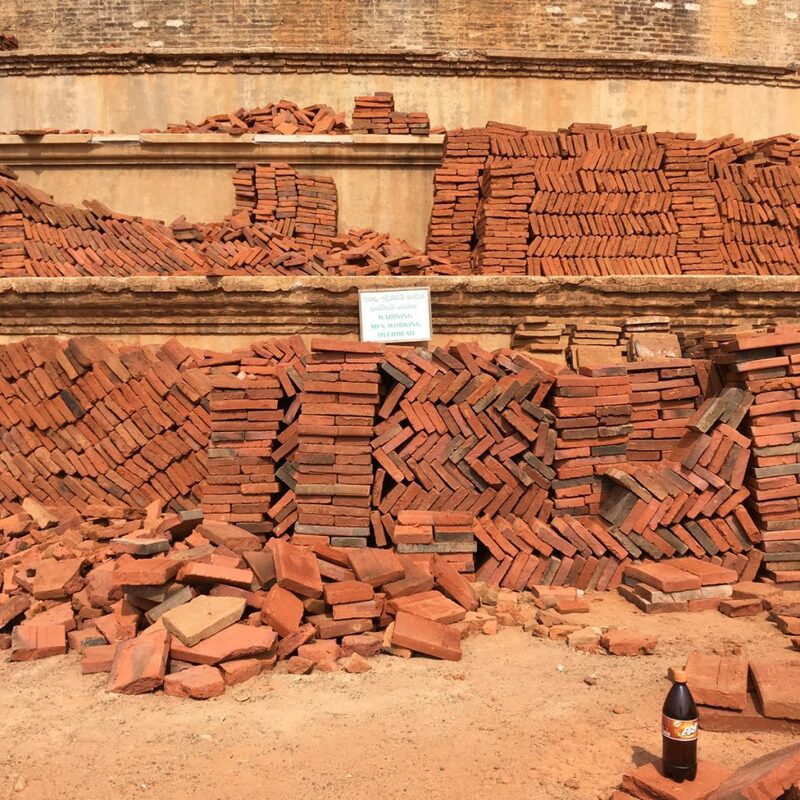 A new stupa is being built, brick by brick. 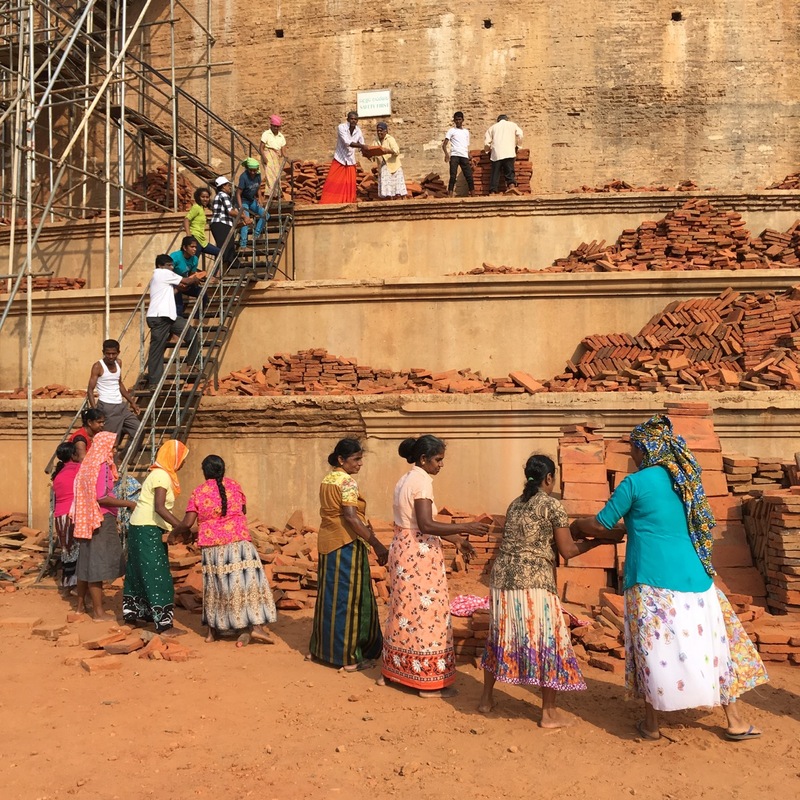 Visitors, devotees, families who have come for the weekend spend a few hours carrying bricks to the top.